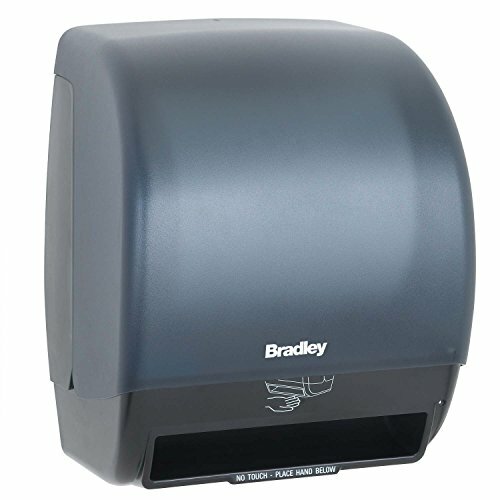 Bradley BradEX towel dispenser constructed of high impact material. Door is translucent, and fabricated from durable high-impact plastic. Dispenses non-perforated roll towels up to 8" in diameter and 8" wide with core sizes from 1-1/2 to 2". Dispenser also allows for 3" diameter stub roll. Towels are dispensed automatically when hands are placed at a natural position below the dispenser. Batteries are not included. Automatic transfer system will integrate stub roll when the primary is nearly depleted. Low battery indicator. Sheet is fully protected until dispensed. Compliant to ADA standards. Measures 12-3/10" width by 15-1/5" height by 9-1/2" depth.